Telangana (TS) LPCET Notification 2018 Apply Online / Telangana LPCET Notification 2018 Apply Online / Telangana (TS) LPCET Notification 2018 Apply Online for www.tslpcet.cgg.gov.in Telangana State Government, School Education (Training) Department has given the GO. MS.No.31 on Dated:17/10/2016 for adaptation of the Andhra Pradesh conduct of Language Pandit Common Entrance Test for Admission into Pandit Training Course Rules, 2006 to the State of Telangana. Now, this order may be called the Telangana State Conduct of Language Pandit Common Entrance Test for admission into Pandit Training Course Rules Order,2016. So, DSE Telangana will invite the online applications from the eligible candidates through its official website tslpcet.cgg.gov.in as per schedule for admission into LPT Courses in TS state for the academic year 2018-2019. LPCET 2018 conducted on 16th May 2018 in all Districts of Telangana state. 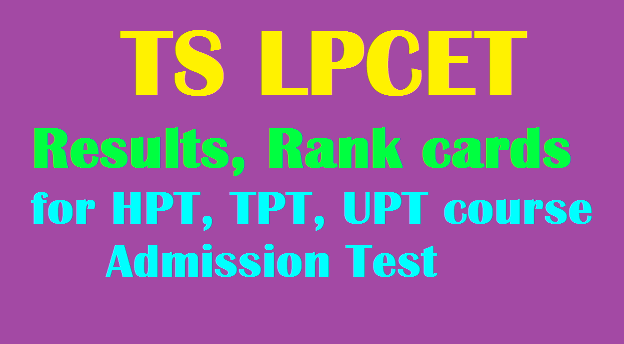 The fee prescribed for appearing for LPCET is Rs.200/-. Candidates can pay fee through TSONLINE or Payment Gateway service. The candidates should have completed 19 years of age as on the 1st July of the year of admission i.e. 01.07.2018. There is no upper age limit. Must possess Graduation with Telugu as one of the Optional subjects /Graduation in Telugu Literature /Bachelor’s Degree in Oriental Language (BOL) in Telugu / Post Graduation Degree in Telugu, from a University recognised by UGC, with minimum 50% marks (In case of SC / ST / BC / Differently abled candidates, the minimum marks shall be 45%). Must possess Graduation with Hindi as one of the Optional subjects / Graduation in Hindi Literature / Bachelor’s Degree in Oriental Language (BOL) in Hindi/Post Graduation Degree in Hindi, from a University recognised by UGC with minimum 50% marks (In case of SC / ST / BC / Differently abled candidates, the minimum marks shall be 45%). Must possess Graduation with Urdu as one of the Optional subjects / Graduation in Urdu Literature/ Bachelor’s Degree in Oriental Language (BOL) in Urdu / Post Graduation Degree in Urdu, from a University recognised by UGC with minimum 50% marks (In case of SC / ST / BC / Differently abled candidates, the minimum marks shall be 45%). 1) The candidates who have passed the above examination as on the date of submission of application are eligible to appear for LPCET – 2018. 2) The candidates who have appeared for final year of the qualifying examinations are also eligible to apply for LPCET-2018 Entrance Examination subject to the condition that they should produce their pass certificates of the Qualifying Examination at the time of counselling without fail. 3) The above qualifications prescribed are for LPCET-2018 only. The Government may prescribe over and above qualifications at the time of Teacher Recruitment Test (TRT). Subjects: Current Affairs, Numerical Ability, Language, Literature. Question Paper will be comprised of a total of 100 questions. Detailed procedure for applying ONLINE is given in the Information Bulletin. Candidates can download the ‘Information Bulletin’ free of cost from the LPCET website: http://tslpcet.cgg.gov.in in this month. Candidates can submit their applications through online mode only. TS LPCET 2018 Exam will be conduct on 16.05.2018.